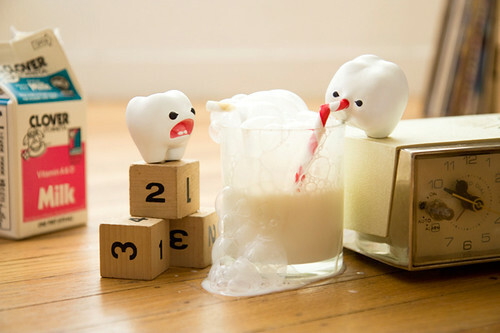 ahahahaa - I used to do that with my milk when I was a kid! Grandpa would say "Do not play with your food"! LOL He would. Adorable!!! A true milk toof! Stop it and let me have a turn! It's normal!... They're a milk toof!!! I love to do that to my Milo. oh that silly Lardee ... lol. ickle is such a little neat freak <3 so adorable. you just squeaking my heart. Love your blog. I just know it. glad to discovered it!! You're one my inspiration blog. I love Lardee's stripy straw and ickle's plain one - both are perfectly suited to their personalities! Hi. I don't think we've met before. And it saddens me to say that, because you're obviously an exceptional, fantastic, and very popular blogger. I actually found your blog from Sparknotes.com. I'm still not sure why I got here. But I do not regret it. The past hour, I've pressed “Older Posts” about 728 times. It's creepy how much I'm enjoying this blog. Anyhoo. I'd be reallllllllllly honored if you took a look at my blog. Go on now. I secretly still like to do this! I used to do that when I was a kid, too, LOL! I love it! I can't imagine anyone not blowing bubbles in their milk at least once in their lifetime. It's fun! it's amazing work, keep doing this inhae! Today my little sister was unhappy. I readed your amazing stories to her, and guess what - first she started to smile, then she grinned and finally she laughed out loud. She said you're gorgeus, and I think so too. Keep doing this and give us way to smile when we're sad. You are my idol and I really adore your imagination. Go, Inhae, go! I love doing that! I blow bubbles in every drink if mom says I can! I love you, ickle and Lardee! By the way Inhae, I e-mailed you earlier today so please reply! Keep posting silly things like this that ickle and Lardee do, please! Amazing!! Congrats for the idea! :) I Love it! hahaha amazing! I just stumbled across your blog and its brilliant! hahahaha I love it! You always have the best compositions and stories! Hey there sweetie, I've awarded you with the Kreativ Blogger Award! Congratulations :) Take a look at it over at petits joies de la vie's Kreativ Blogger Award . Keep up the great blog. A NEW POST SOON PLEASE!!!!!!!!!!!!!!!!!!!!!!!!!!!!!!!!!!!!!!!!!!!!!!!!!!!!!!!!!!!!!!!!!!!!!!!!!!!!!!!!!!!!!!!!!!!!!!!!!!!!!! Your blog is my favvorite. oh my, they are soooooo cute and adorable!!! i really love this blog. so cute! I look forward to visiting with you again. OMG, your photos are the cutest, most adorable things ever! Seriously, people look at me weird because i laugh out loud when i read your blog.... I cant help it. Thanks. they r hilarious! plz keep it up i <3 milk toofs!